Gaining popularity rather quickly, Surfshark offers what appears to be one solid VPN service. Scroll down to read about its features in more detail. A new player in the game, Surfshark promises many advanced features that premium VPN providers offer. For example, they use Double VPN like NordVPN, which makes their connections more secure through double encryption. And like ExpressVPN, they use zero-knowledge DNS. This means they run a private DNS for every server, leaving little room for security breaches. Annoyed with ads? Surfshark also has a built-in ad blocker called CleanWeb. 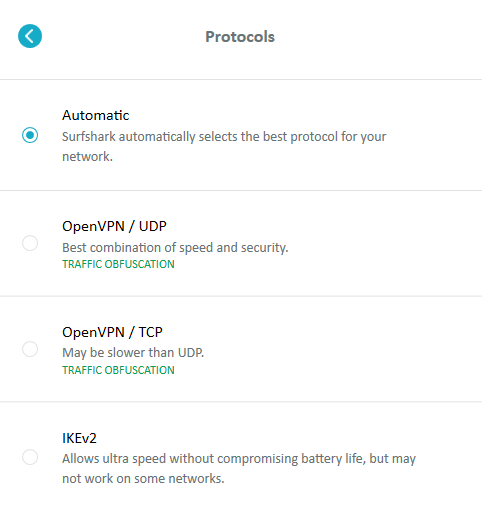 So now that we know Surfshark offers features only included in top-of-the-market VPNs, let’s see how the rest of it measures up. 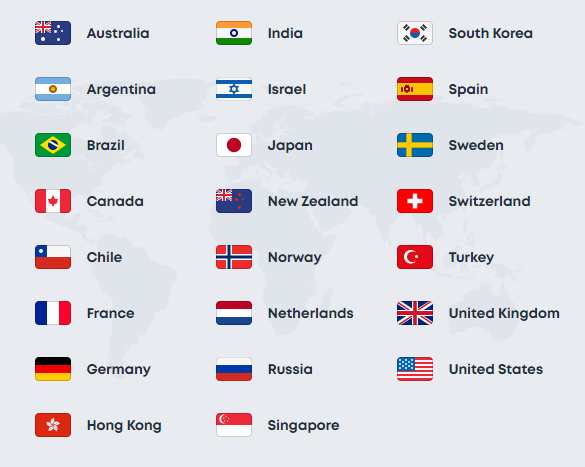 Surfshark provides a ton of servers to choose from: 500+ servers in 50+ countries. For a rookie VPN, it isn’t bad at all. There are multiple servers available in countries like the United States, Belgium, Italy, Poland, and the United Kingdom. While top-range VPNs offer thousands of servers, 50 countries is an impressive size as you won’t be limited to a select few locations. We expect them to update the list as they grow. All in all, this is a very promising start. The black screen of VPN failure was fortunately absent with Surfshark. Even the best VPNs for Netflix can struggle to keep up with Netflix, so the fact that Surfshark passes this test is a very good sign. It’s probably also due to Surfshark’s servers being so new that Netflix hasn’t caught on. We’ll keep a closer eye out for this. 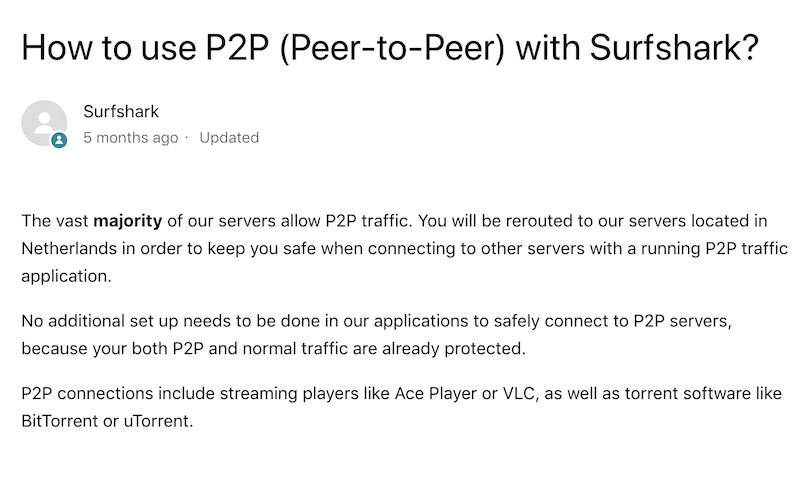 In case you’re wondering how the VPN holds up with torrenting, you should know that Surfshark can support torrenting and P2P services. Users can easily torrent different files securely with the help of Surfshark’s excellent encryption and CleanWeb feature that protects your computer from malware. The only downside is that we didn’t get great speeds with Surfshark, which sadly places them out of our top picks for VPNs to torrent with. Surfshark is available for $11.95 on a monthly plan, $5.99 for 12 months or $3.49 for 24 months. A single plan can be used on unlimited devices. Bandwidth is also unlimited with their plans. Surfshark users don’t have to worry about maxing out on data use. Considering all the features you get with Surfshark, the long-term subscriptions are very appealing. $83.76 doesn’t seem so bad for two years of VPN service. Surfshark provides a 30-day money-back guarantee for unsatisfied users to get their money back. Of course, you cannot break their Terms of Service during this time. All you need to do is contact them via live chat or email. You can pay for Surfshark in a variety of ways including PayPal, credit cards, cryptocurrency, Alipay, and other methods such as Dragonpay and Tenpay. Any decent VPN should offer anonymous payment methods on principle, so we’re happy to see cryptocurrency offered here. Surfshark is compatible with most devices and offers native clients for Windows, macOS, iOS, Linux, and Amazon Fire TV Stick. Browser extensions are available for Chrome and Firefox. That’s a solid range of devices, and depending on the platform you choose, Surfshark also offers a 7-day free trial. Oh, and let us remind you again: there’s no limitation on the number of devices you can use simultaneously with any of their plans. Yep, you read that right. The interface of the VPN is very clean and simple. Connecting to a server is as easy as hitting a button on the main screen. Once the app loads, you can quickly turn the VPN on and let it choose the best server or you can choose one yourself. You’ll also see your recently used servers so that you can quickly connect to your preferred servers. Accessing different settings is easy because it’s neatly organized in their settings page. There are convenient buttons for changing your password, contacting support, and renewing your account without leaving the app. Surfshark deserves an A+ when it comes to customer support. 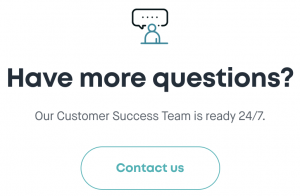 They have a 24/7 live-chat feature in addition to email support. Surfshark has a help center that contains guides and FAQs for various topics ranging from technical to billing issues. Their blog is also a well-designed and informative place for any VPN or privacy-related topic. They only collect a user’s email, password, billing information, and order history. The tracking stops there. If you use cryptocurrency to pay for their service and use a fake email address, it’s possible to stay completely anonymous. 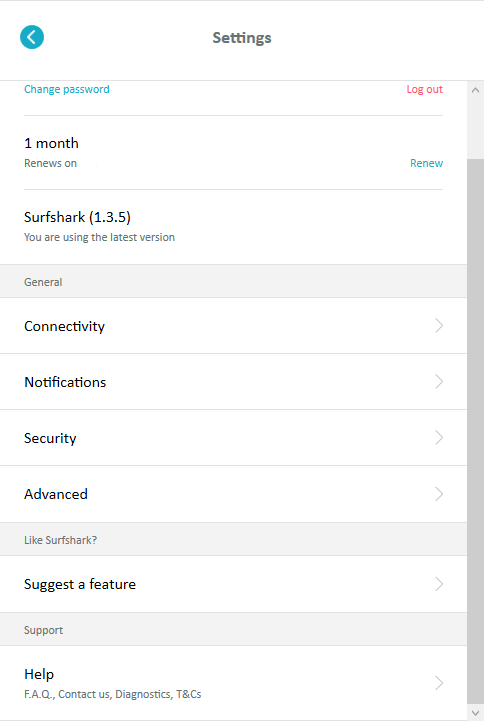 Unlike many other VPNs, Surfshark doesn’t keep IP addresses, browsing history, session information, used bandwidth, connection logs, timestamps, network traffic, and other similar data. Users should be aware that this service is relatively new and its promises untested. It’s definitely something to keep in mind. All of the good features of Surfshark would be useless if we found out it fails to hide our IP address and DNS information. But with their zero-knowledge DNS and double VPN features, we weren’t too worried. We’re happy to report that Surfshark has successfully hidden our IP and DNS. Their promise of secure and anonymous connections is well kept. Surfshark uses 256-bit AES, military-grade encryption to encrypt transmitted data. It supports two protocols, OpenVPN and IKEv2. You can easily switch between protocols by choosing which protocol to use by going to Advanced Settings -> Protocols. Kill Switch: You bet there’s one! 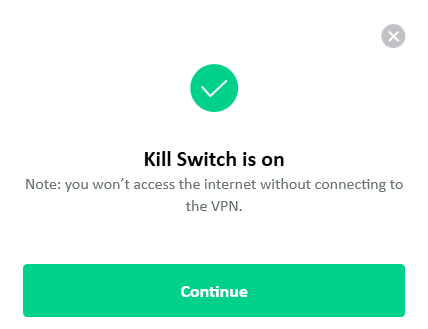 An important feature of a VPN is a kill switch. 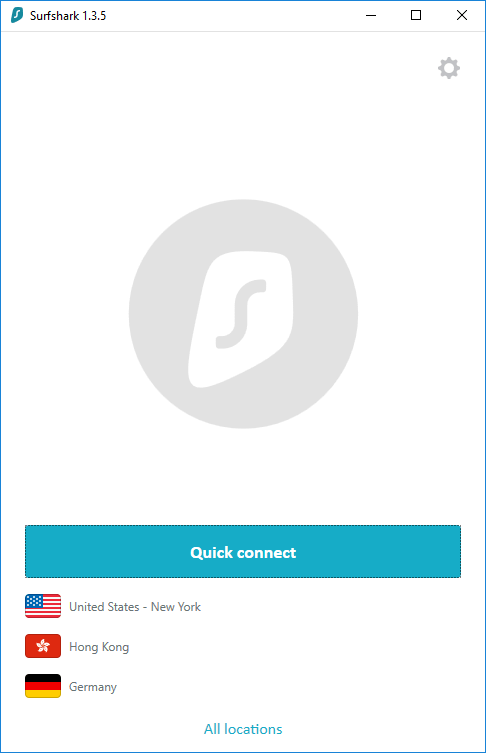 A lot of VPN services in the market lack one but thankfully, Surfshark isn’t like those VPNs. Surfshark has a kill switch and you have the option to turn it on or off. For extra security, when the kill switch is on, you won’t be able to access the internet without the VPN. So if you’re a little bit forgetful, Surfshark has your back. Surfshark’s promised ultra-fast speed wasn’t really that fast. It was just okay; speed losses were somewhere around 40% which isn’t terrible. They do not collect personal information but it’s impossible to create an account without purchasing the VPN first on a desktop unless you get the macOS app. If you want to try the product first, you can test it out by getting one of their mobile apps or their app for macOS that all offer a 7-day free trial. If you’re on Windows or Linux, there’s still a 30-day money-back guarantee. Surfshark, Ltd entered the market in 2018. Not much is known about the creators of Surfshark. All we know is that they are based in the British Virgin Islands and provide one good VPN. Surfshark, Ltd. is registered in the British Virgin Islands, which are not a part of the 14 Eyes Alliance. They don’t have laws that require companies to keep track of user data. Surfshark has a warrant canary that guarantees a no logs policy and promises not to give up user information to the government. This VPN is something that shows a lot of promise. It’s a highly reasonable VPN service provider with great features and a good price tag. It has most of the features you could possibly need in a VPN. It checks all the boxes for being Netflix-friendly, torrenting-friendly, and also carries a kill switch. It’s in a privacy-friendly jurisdiction, has a warrant canary, and features extra security with double VPN encryption and private DNS on all their servers. 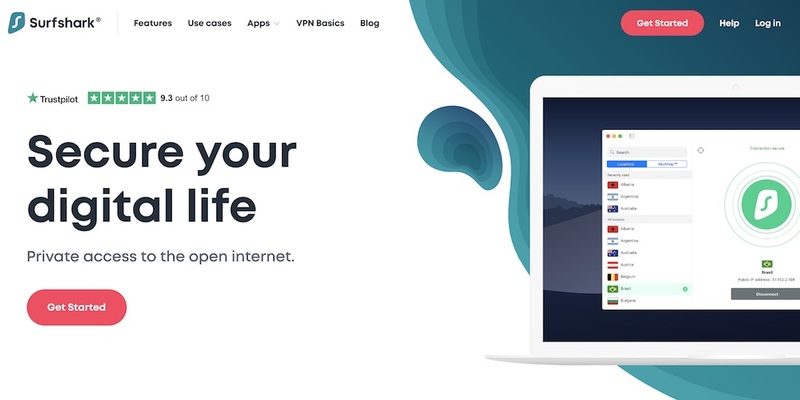 Sure, it could improve its list of servers and work on getting those ultrafast speeds, but they seem to be on the right track towards becoming one of the best VPN services available in the market. At the moment, it’s a little too early to tell, though. The business is still fairly new and there hasn’t been any serious testing done on Surfshark. Only time will tell.